Xilisoft Video Converter is one of my favorite in this list and one of the best Video Converter software in the market, with Xilisoft you can convert popular video formats like AVI, MPEG, WMV, MOV, etc with the perfect output quality to various video devices and Mobile phones, also with Xilisoft you can convert audio and pictures, with rate of speed and easy to use interface. Xilisoft Video Converter is a useful piece of software for converting audio and video files to different formats, make it one of our best Video Converter software. Xilisoft Video Converter Ultimate, a multi-functional audio and video format converter can convert from video to video, audio and picture, especially convert AVI to MPEG, as well as audio to audio and picture to video. Besides work as an AVI converter. HD Video , AVI (DivX, Xvid, etc. ), MP4 (inc. Sony PSP, Apple iPod and Archos), WMV, 3GP, 3G2, QuickTime (MOV, QT), SWF, FLV, F4V, DVD, MPEG-1, 2, 4, MPG, MJPEG, H.263, H.264, MKV, MPEG1 DPG, AMV, MTV, GIF, TS, M2TS. 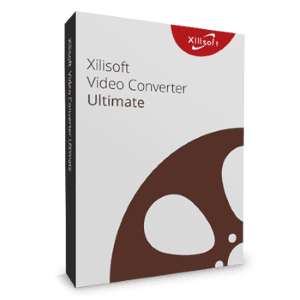 Xilisoft Video Converter Ultimate Software is pretty easy to navigate and understand the settings. What I like, especially, is the little thumbnail devices that go with the file format so that for beginners like me, all I need to look for is the little thumbnail that corresponds to my gadget! . Xilisoft Video Converter Supports a wide range of HD video formats, Xilisoft Video Converter allows you to convert between multiform HD formats such as H.264/MPEG-4 AVC, AVCHD Video (*.m2ts, *.mts), Apple TV h.264 720P, MKV, HD WMV, and MPEG2/MPEG-4 TS HD Video, as well as convert videos from HD to SD.. 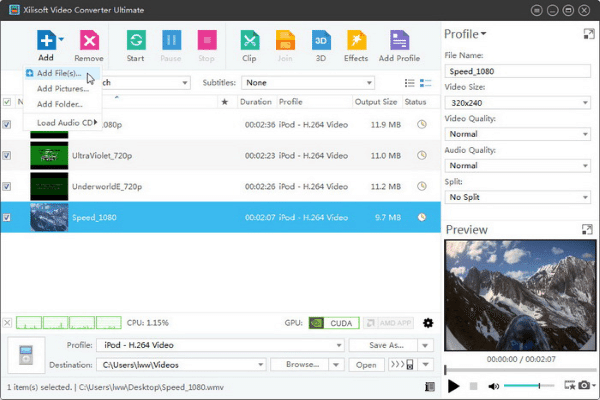 The HD workflow will allow you to convert video to and from high definition video formats. in full HD quality without any loss in performance or quality. 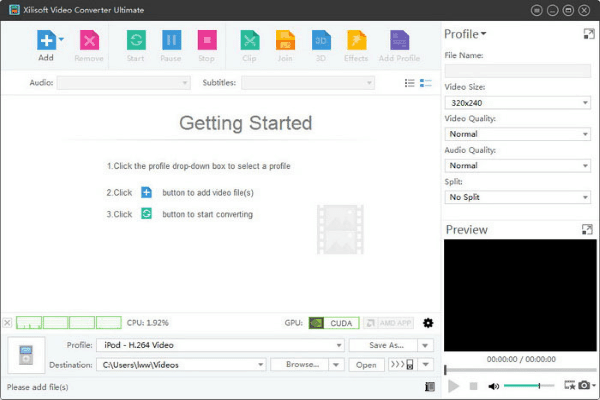 Xilisoft Video Converter provide features to edit your video like adjusting or crop the picture frame and you can merge several files into One , so you can Enjoy your video/audio/picture collections differently by merging several of them together; add transitions between every two videos/pictures for enhanced viewing. Overall Xilisoft Video Converter is a powerful program that achieves what it sets out to convert several different Video/Audio files types into formats compatible with your favorite media players. the price is little expensive as compare to Movavi and AVS. Xilisoft Video Converter is a powerful program that achieves what it sets out to convert several different Video/Audio files types into formats compatible with your favorite media players. the price is little expensive as compare to Movavi and AVS.